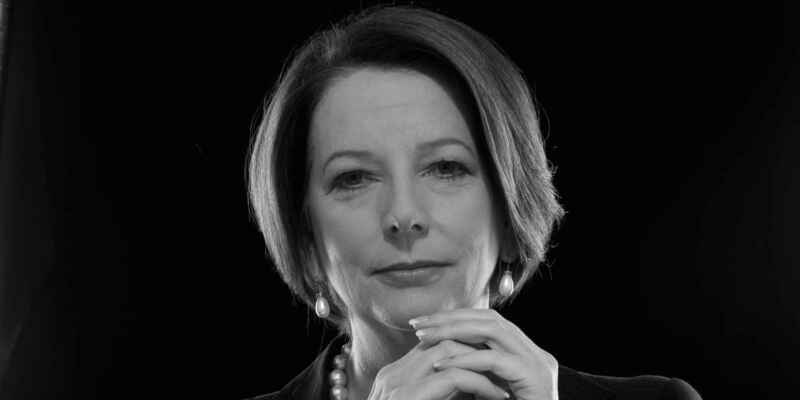 Julia Gillard became Australia's 27th prime minister, and the first woman to hold this position, after a leadership ballot in the Labor Party in which she defeated Kevin Rudd. 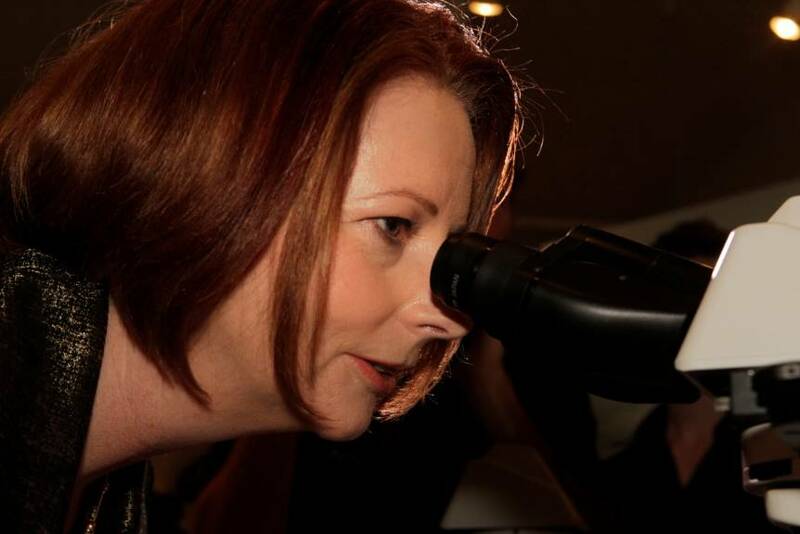 By any measure, the bar was set very high for Julia Gillard. She came to the fore within a divided party, to then lead the first minority government since the Second World War. All the while she also needed to weigh up whether she could harness, or ignore, the unique circumstances associated with being Australia's first female prime minister. 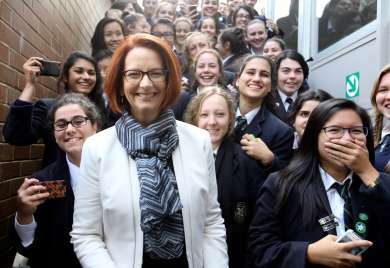 Julia Gillard took an interest in politics in her youth, and began working towards a political career as a student. She practised law for eight years before resigning to work for the Victorian Labor Party. In 1996, Gillard ran unsuccessfully for the Senate in the federal election, but was elected to the House of Representatives in 1998 in the seat of Lalor. Within five years she had become the Manager of Opposition Business and, by 2006, Deputy Leader to Kevin Rudd. She entered into government for the first time when the Labor Party won the election in 2007, becoming a senior minister and Deputy Prime Minister. By 2010, the party was facing increasing pressure to abandon key policies and, in a surprise move, Julia Gillard defeated Kevin Rudd in a leadership spill to become Prime Minister. Labor narrowly won the 2010 federal election and formed a minority government after four of the six cross bench members supported Gillard. Her years as the nation's leader were difficult to manage and by 2013 it seemed impossible that the party would win the upcoming election. This led to a second leadership spill and, after the caucus voted 57-45 to replace Gillard with Rudd, she stepped down and retired from politics. The Gillard Government commenced full implementation of the National Broadband Network in 2011, following a trial rollout in Tasmania in 2010. The goal of the NBN is to improve internet access across Australia. The highly contested Clean Energy legislation was passed in the Senate in November 2011. This policy measure directed at climate change established a three year period of fixed carbon pricing to reduce emissions followed by an Australian emissions trading scheme. As a measure to deter Australians from smoking, the Gillard Government introduced plain packaging laws in November 2011. This reduced the attractiveness of cigarette packaging and made health warnings more salient. In November 2012 the Gillard Government called for a Royal Commission to investigate claims of child sexual abuse in institutions including churches, schools and clubs, and the adequacy of their responses. In response to growing community awareness of a need for major reform of disability services, the Gillard Government established the NDIS in March 2013. The scheme aims to offer individualised support for people with permanent and significant disability, their families and carers. On 27 June 2013, the final day of the Gillard Government, the Australian Education Act passes the Senate. This Act implemented reforms proposed by the Review of Funding for Schooling (the Gonski Review) in 2011. After the 2010 election, Gillard led the first minority government since the 1940s. On any vote, then, she would rely heavily on the six cross bench MPs. While Gillard acknowledged the difficulties of managing such a parliament, she set out to lead a reforming government and achieved the passage of a lot of legislation. Her stance on climate change remained contentious, and at one point a group of protestors in the gallery were ejected by the Speaker for disrupting Question Time, but the government was able to get the Clean Energy Bill passed in 2011. In October 2012, reacting to the Leader of the Opposition, Gillard gave her renowned ‘Misogyny Speech’ in the House of Representatives, sparking considerable debate about the treatment of women in politics and in the broader Australian community. The speech achieved international attention, but failed to turn around the domestic opinion polls, which were looking dire for the Labor Party. Gillard’s ascension to the prime ministership exposed complexities associated with factionalism within the Labor Party, and some members saw her move against Rudd as traitorous. Though she maintained the support of many key members of the party, issues continued to arise. In February 2012, a leadership vote took place in the Labor caucus between Rudd and Gillard, but she held the firm support of the party and won by a vote of 71-31. A second leadership spill was called in March 2013, however Rudd chose not to oppose and the status quo was maintained. Facing an almost inevitable defeat in the 2013 election, a third leadership spill was called on June 26. This time Rudd decided to run against Gillard and won by 57 votes to 45. Gillard then resigned, and six Labor ministers also resigned from Cabinet in protest, including Craig Emerson, Joe Ludwig, Greg Combet, Stephen Conroy, Peter Garrett, and the Deputy Leader and Treasurer, Wayne Swan. From early in Gillard’s political career, former Victorian premier Joan Kirner was a strong supporter, mentor and friend. Joan Kirner, along with a group of prominent Labor women including Gillard, set out to establish EMILY’s List in Australia. EMILY’s List was based on an American concept that aimed to create a national network to get women elected, and attract financial donations for candidates. In 1996 EMILY’s List Australia was launched, and Gillard was one of the first to donate putting up $1000. Gillard also performed on stage in a fundraiser for EMILY’s List with Joan Kirner for the latter’s 60th birthday, along with Jennie George and Mary Delahunty. They sang the rock anthem I Love Rock’n’Roll, which reprised Kirner’s memorable Late Show television performance. EMILY’s List now has over 3000 members nationally and has helped get over 200 women elected, including Gillard herself. As prime minister, Gillard was a member of EMILY’s List and continues to promote and support it. I know reform is never easy, but I know reform is right.